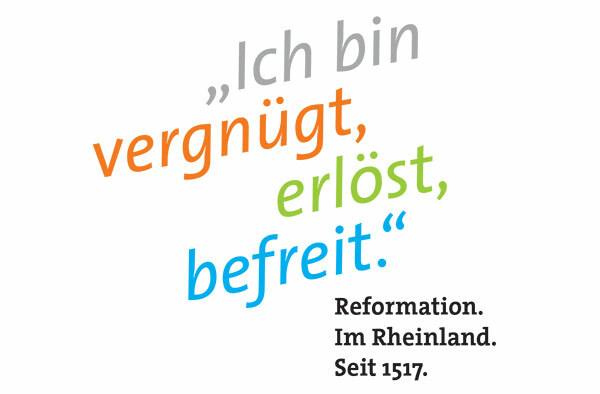 “I’m full of joy, redeemed, set free” is the slogan being used by the Evangelical Church in the Rhineland for the 500th Anniversary of the Reformation in 2017. It brings together the collective activities of the Rhineland Church and fits in with the target that the Evangelical Church in the Rhineland has set itself for the Reformation Anniversary: that of constantly bringing back into conversation the core message of the Reformation, an orientation towards the Word of God. 500 symbolic events, both large and small, are being prepared in local Rhineland parishes. In addition plans are being made at the Regional Church level. The project “95 Worship Services” is aimed at bringing faith into the everyday world. Services of worship will be celebrated in unusual places, such as for example in a petrol station, a doll museum, a shopping arcade and a sewage system. The Rhineland Church is also daring to take a sideways looks at the Reformation in collaboration with the NN Theatre group from Cologne, who will stage a play about Luther with the title “I fear nothing”, which draws parallels with the Reformation in our own time. “I fear nothing” will be performed in more than 60 Rhineland churches. Most of the congregations will participate in the performance by creating their own choir for the project. A new approach to the Reformation will be offered by the arts project “reFORMation transFORMation” which has been initiated by the Rhineland Church. The work of eleven artists will be presented for the first time at a private viewing in Düsseldorf in March 2017 and will then go on tour around a further five centrally located churches in the Rhineland. The impulse for change is also a feature of the magazine project “500 years Reformation – now what! ?”, to which students and young professionals in the fields of journalism, theology, graphic design, photography, as well as printing and media technology, are invited to take part. Other plans include a season of 13 large-scale concerts, a poetry slam, a pop-oratorio, an art-installation and a travelling exhibition on women reformers as well as an ecumenical Christ-festival. Manfred Rekowski, President of the Evangelical Church in the Rhineland sees the celebrations during the year of the Reformation anniversary as being “ecumenical signs”. Increasing trust between the Churches is bringing them together, according to Rekowski, and he gives as an example the joint declarations of the Protestant and Catholic Churches, along with a “flourishing of neighbourly ecumenism” in the local parishes. Without trying to conceal denominational divisions and conflicts, the change of perspective in relation to Christ lies right at the heart of the Reformation. “A common view of Christ is shared today by all the Christian denominations”. For example, working with refugees demonstrates “how remarkably well” the Churches are able to co-operate together. On the evening of the key date of 31 October 2017, President Rekowski will hold a joint celebration of Evening Prayer together with the Archbishop of Cologne, Cardinal Rainer Woelki.